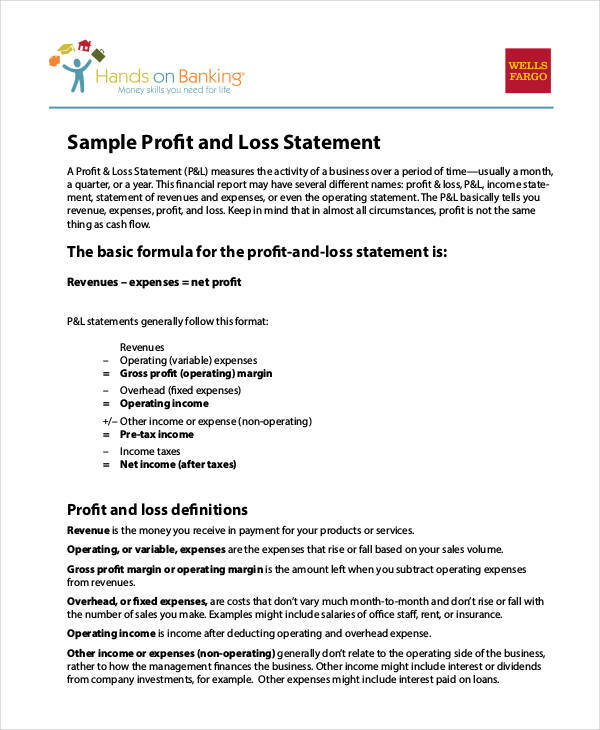 Profit and loss statements or simply income statements are most essential to business. 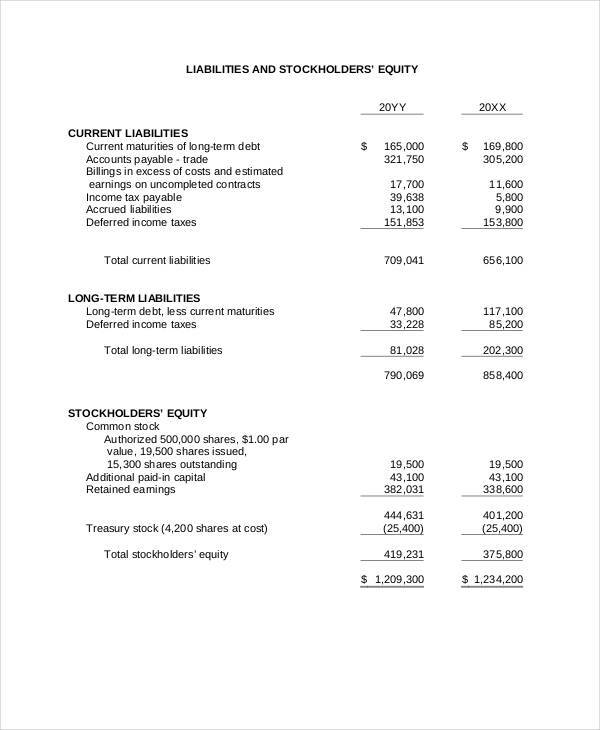 Income statements are used in business plans or strategic plans to analyze where the company or organization is standing in terms of its assets and liabilities. 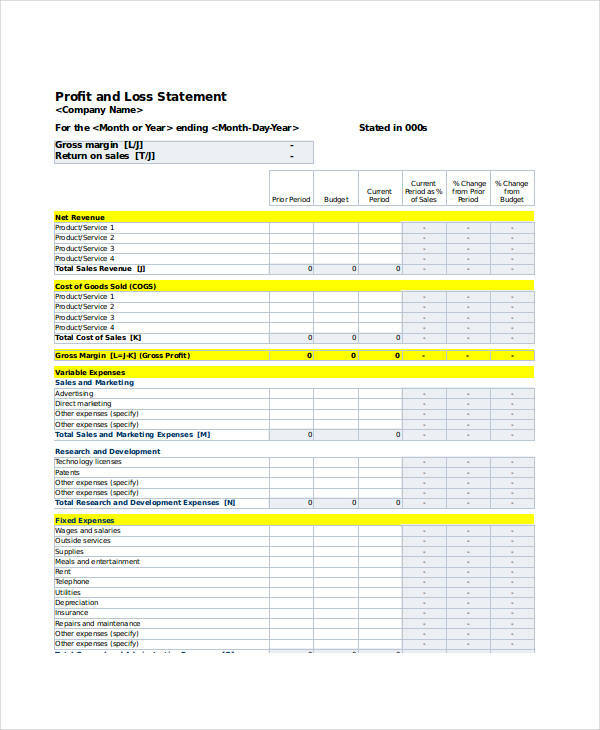 Simply put, income statements reflect the current state of your business whether it is actually profitable or not. 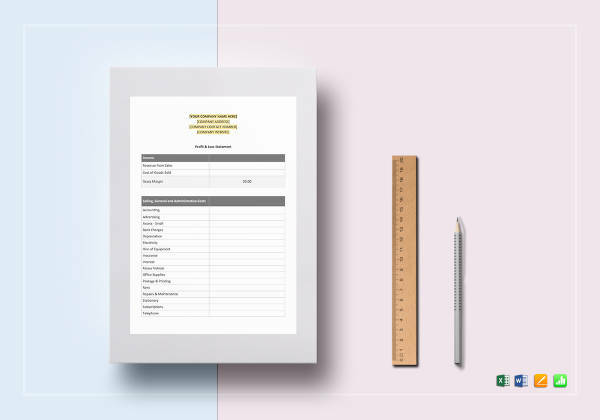 The reports contained in your income statement may also serve as a personal branding statement to your creditors or shareholders informing them the current standing of the business. 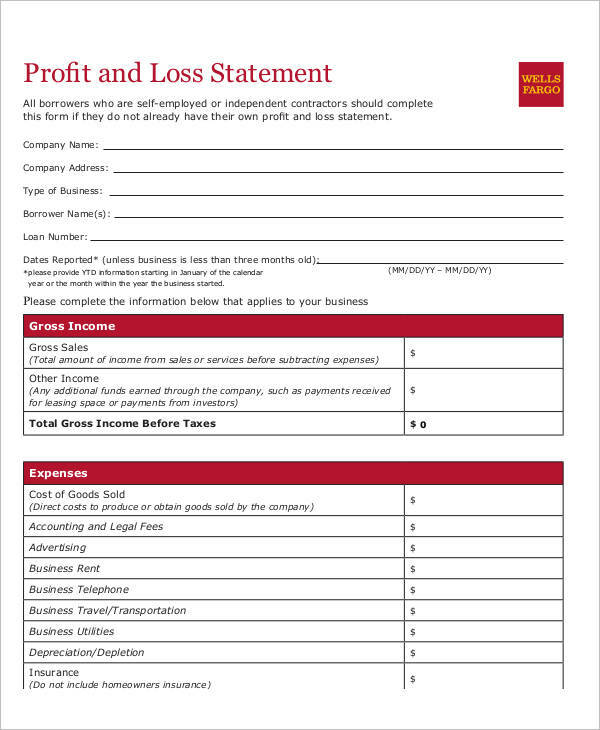 There are many examples of profit and loss statements found in this page. Just click on the download button to access the file. Revenues and Gains. 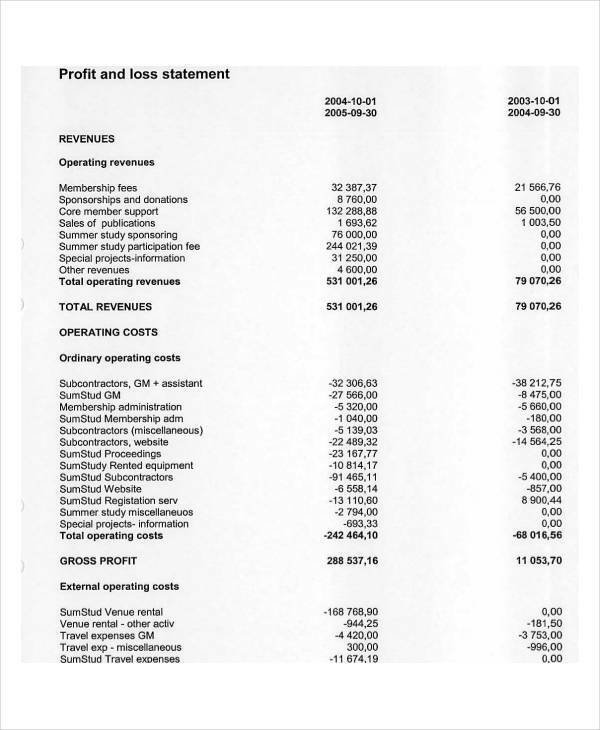 Referred commonly as operating revenues or sales revenues. 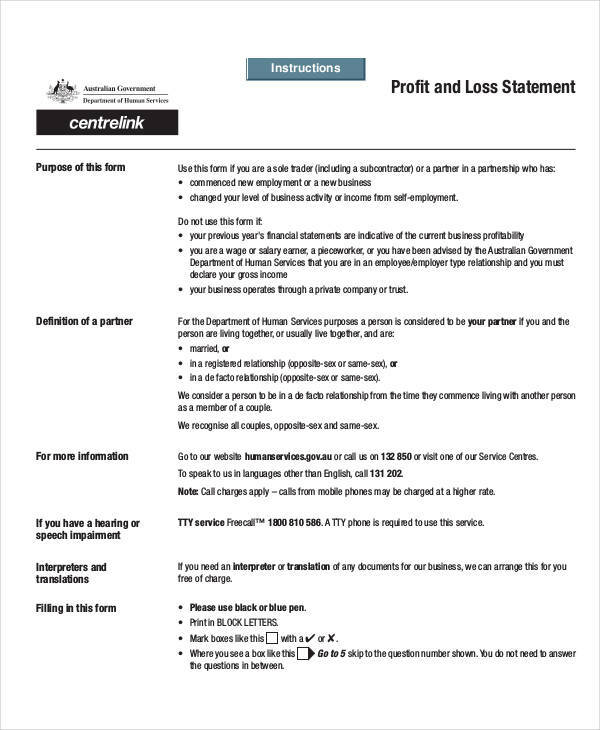 This is shown in the Free personal profit and loss statement example found in the page. 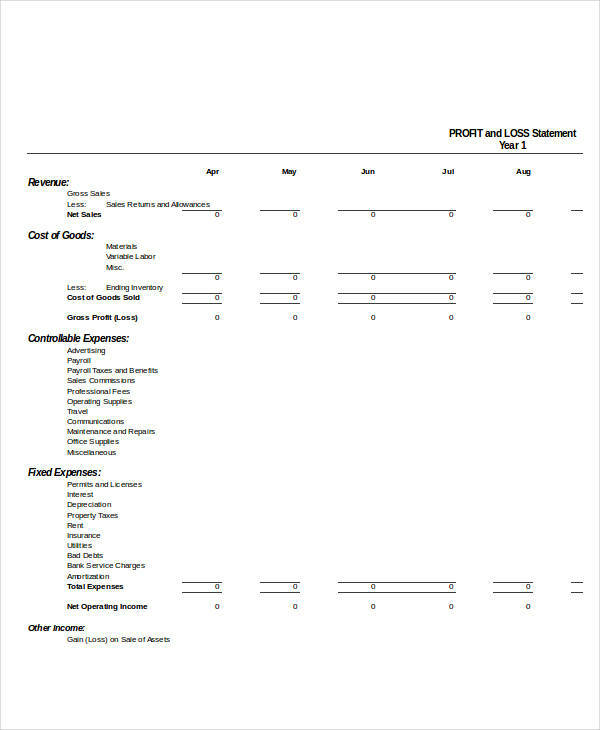 Expenses and Losses. 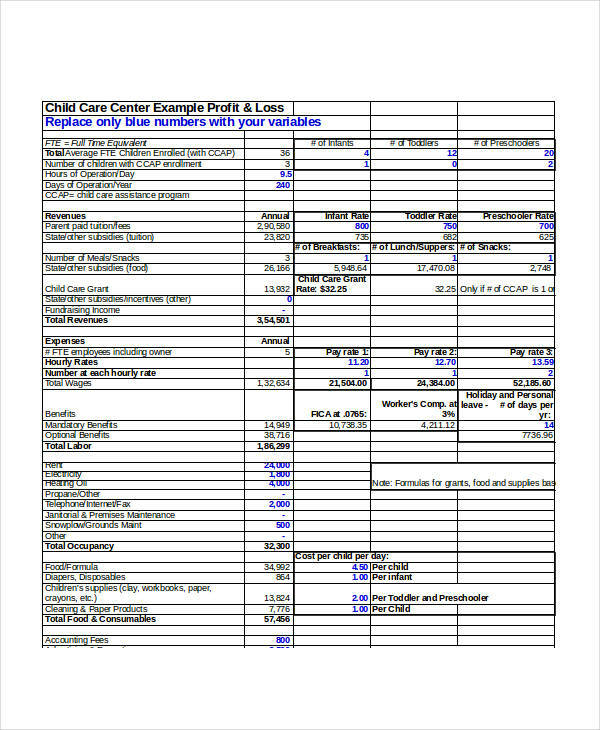 These costs represent expenses made for the business to earn or achieve normal operating revenues. 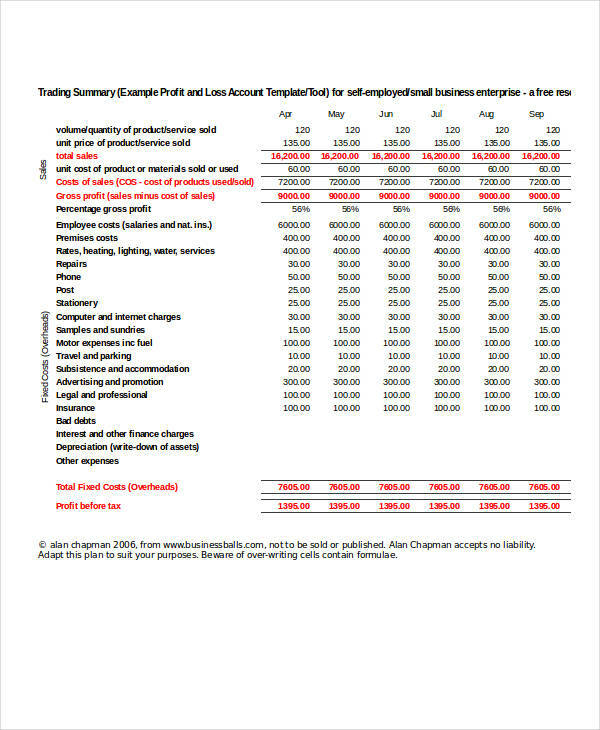 The sample personal profit and loss statement shows this element in more detail. 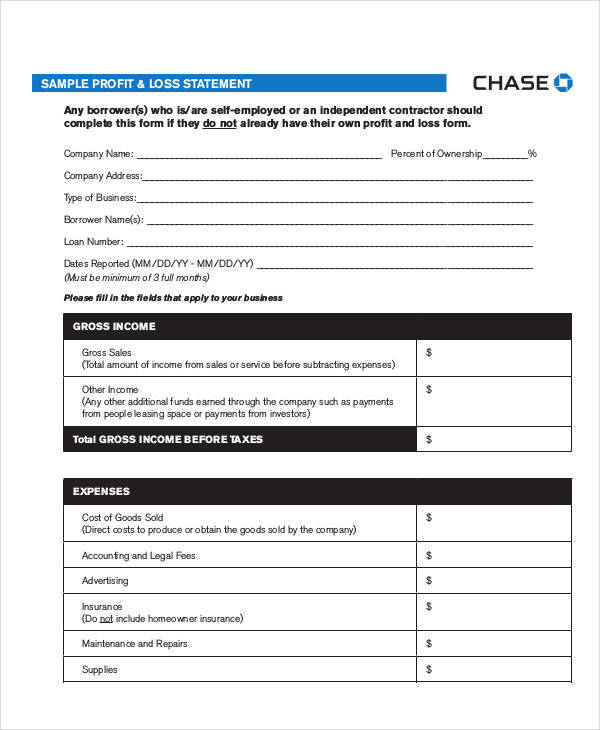 Sources of income – checks, credit card payments, etc. 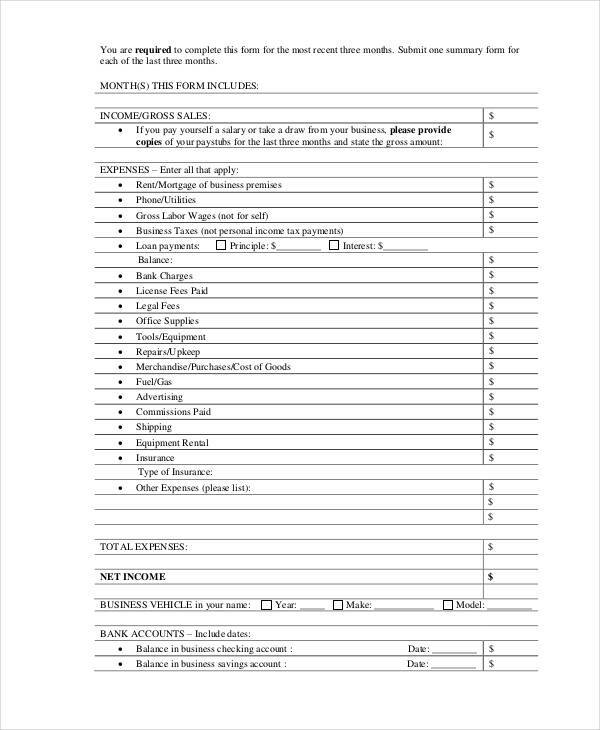 All of this information is likewise found on your bank statements. 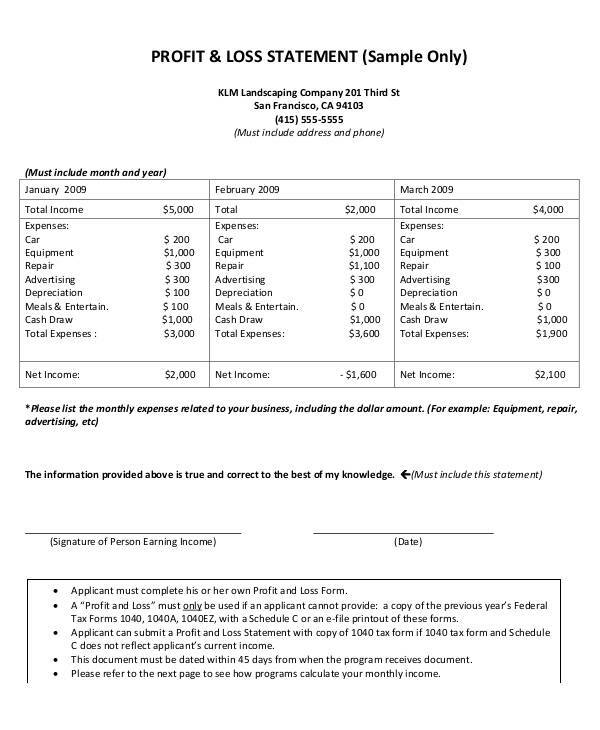 The Header – This part of the income statement contains the name of the statement, company, and the ending date of the time period for the statement. 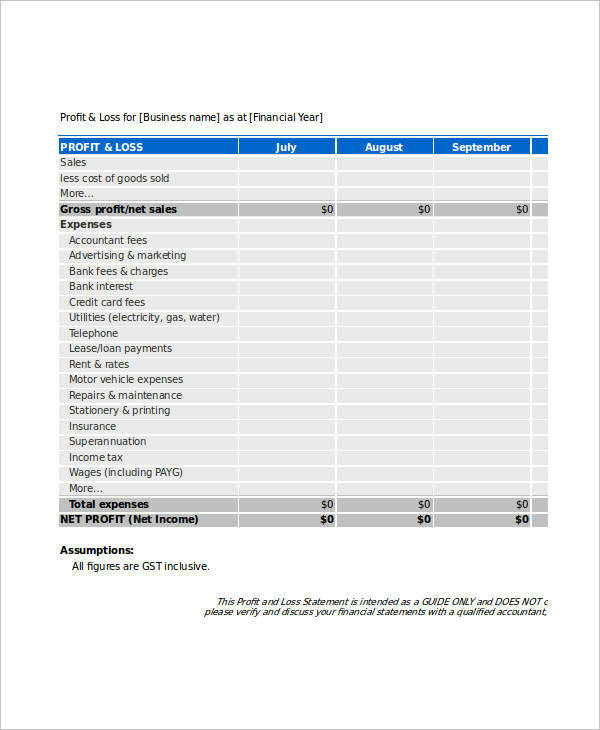 In one of the statement examples shown on the page, specifically the Printable Business Profit and Loss Statement example, the header can be clearly seen and under it the supposed company name and time period of the profit and loss statement. 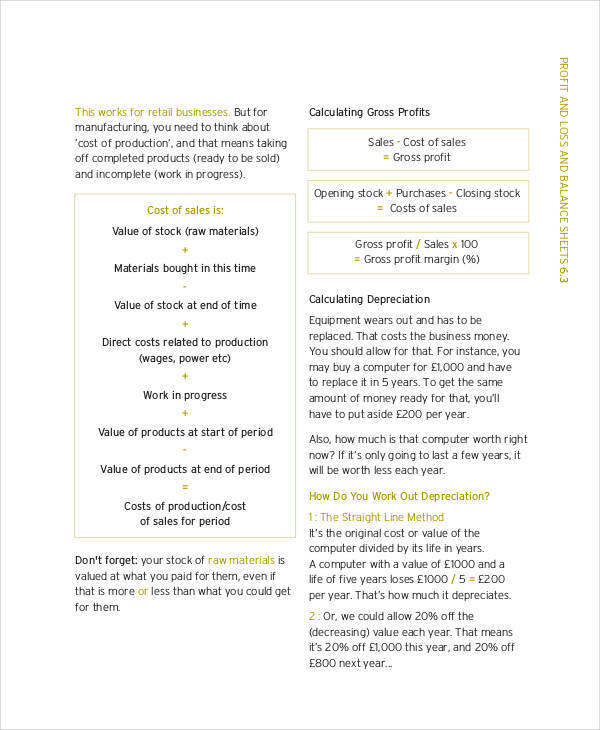 Income or Revenue – This represents the total income or revenue gained from a specific item listing in your statement. 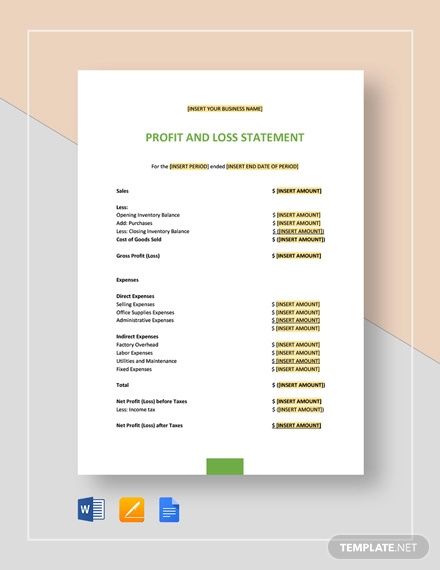 In the example Standard Profit and Loss Statement, all revenues for the company can be seen and listed. 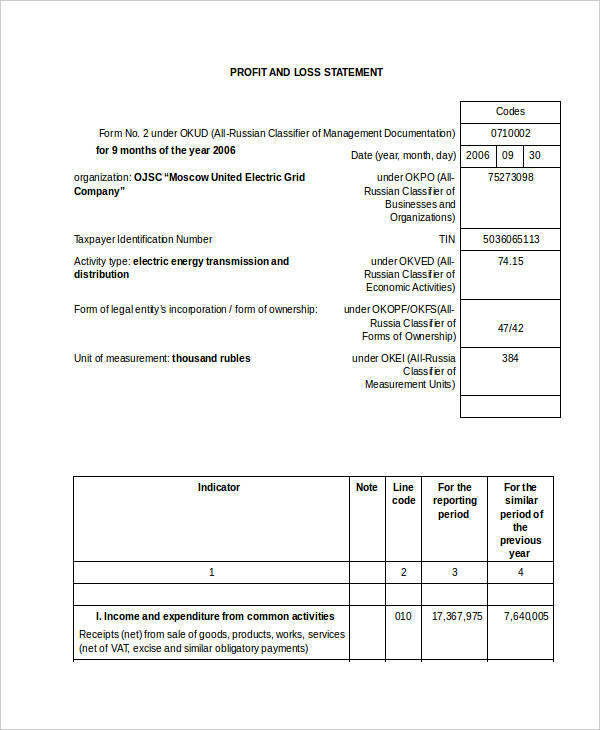 The total revenue for that specific item is clearly stated in reference to the time period of that financial statement. 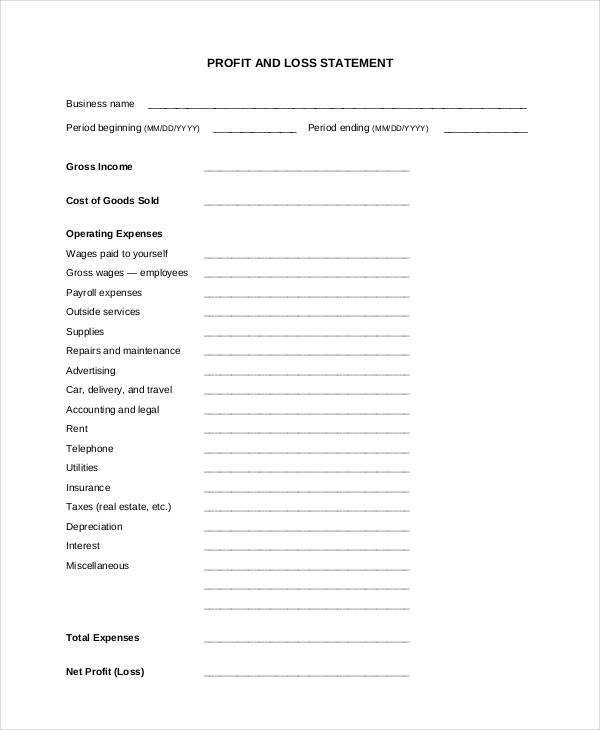 Expense Listing – All expenses in relation to the operation of the business are listed or detailed in this portion of the statement. 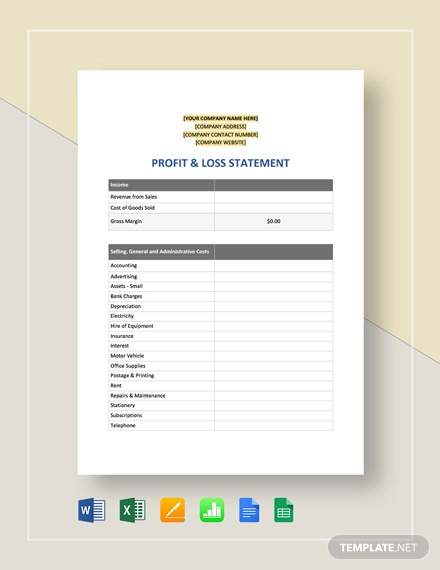 The example Real Estate Profit and Loss Statement shows all expenses incurred by the business including maintenance, repair, accounting, insurance, and advertising costs for the business. 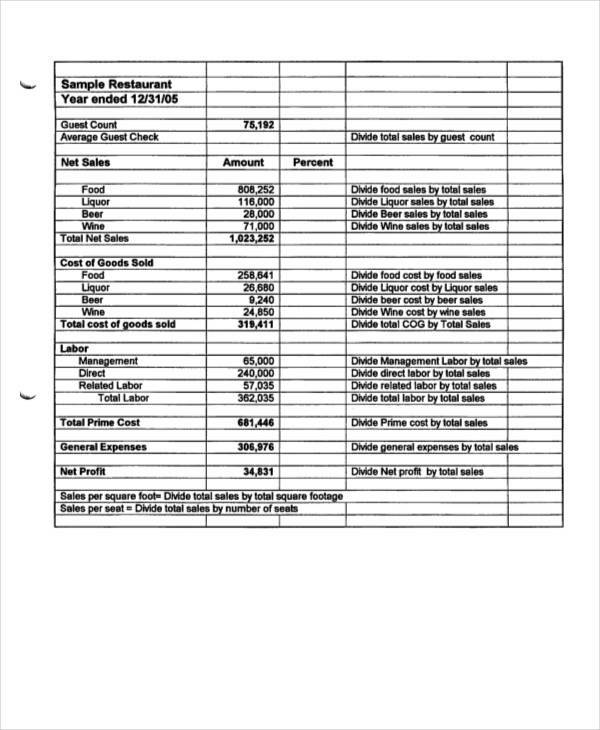 Each line item here shows the summary of each expense item included in the list. 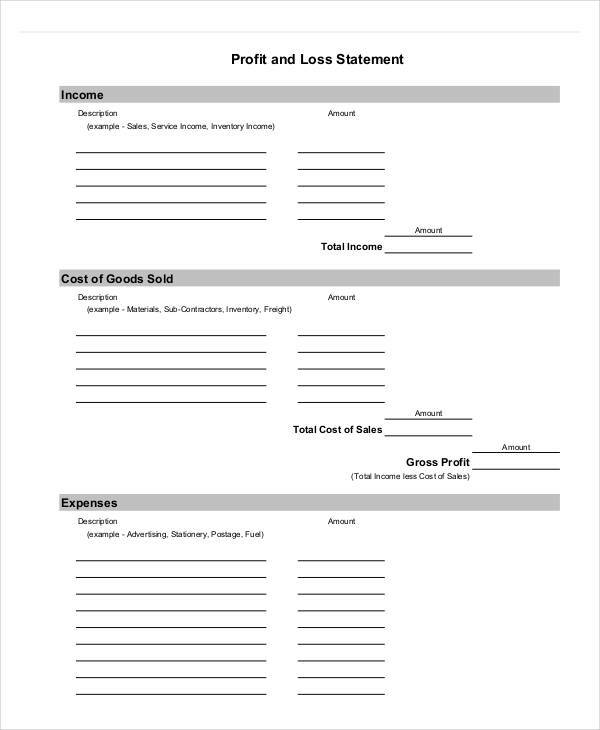 Expense Percentage – This part of the statement displays the calculated percentage per expense to the gross income before the expenses. 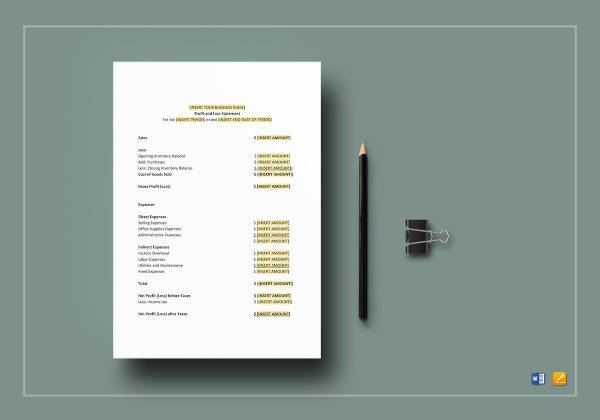 This is specifically helpful later on with your business plans, marketing plans, or strategic plans by analyzing the effect of an expense in relation to income over a period of time which in turn help in making necessary adjustments of expenses before they go out of hand. 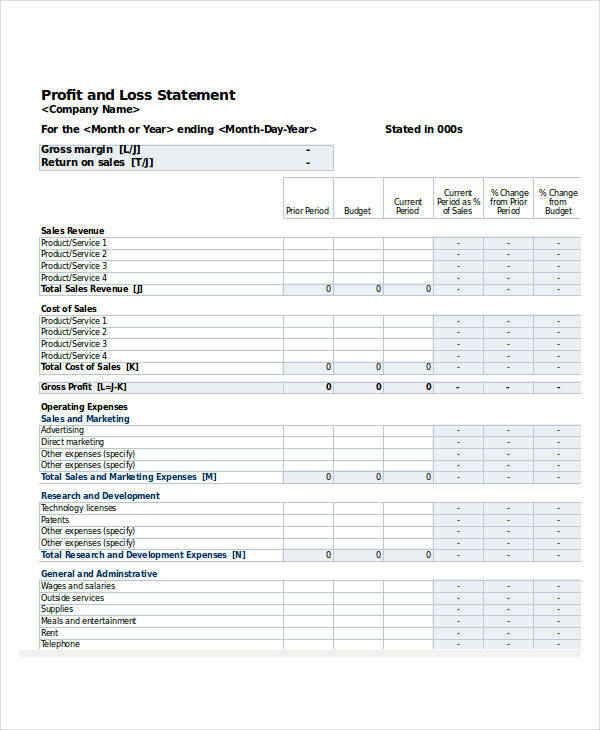 An example of this part is shown in the Personal Monthly Profit and Loss Statement found on the page. As seen on the example, changes in between time periods is noted as well as the percentage it has deviated away from the actual budget. 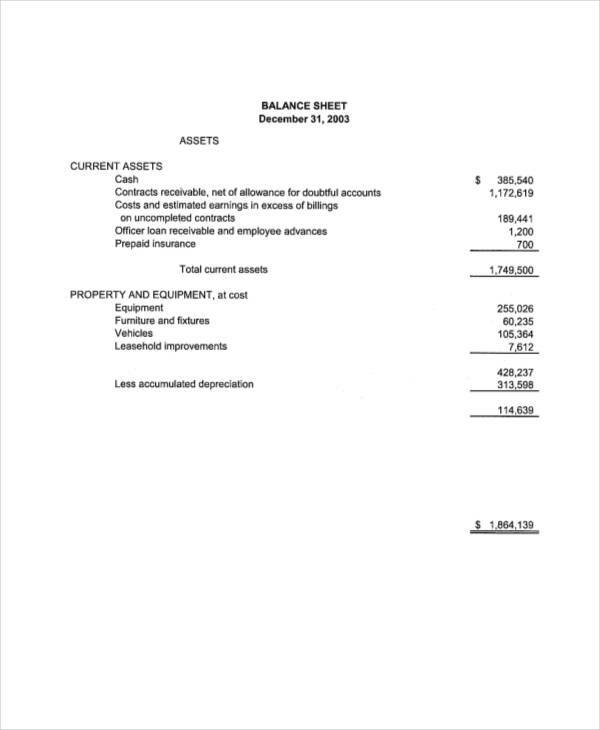 Sales – This would be the net income of the business including all avenues of sales in the company. 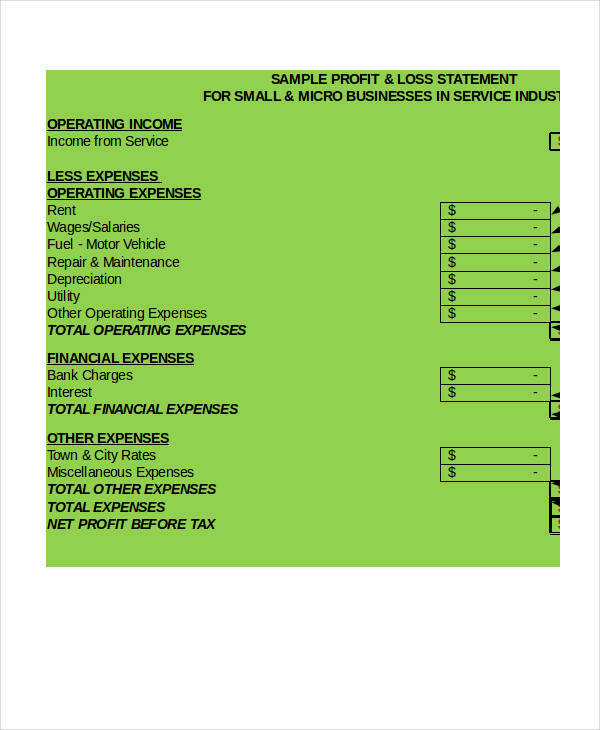 Expenses – Expenses are itemized and shown to be a percentage of the each expenses to the net sales. 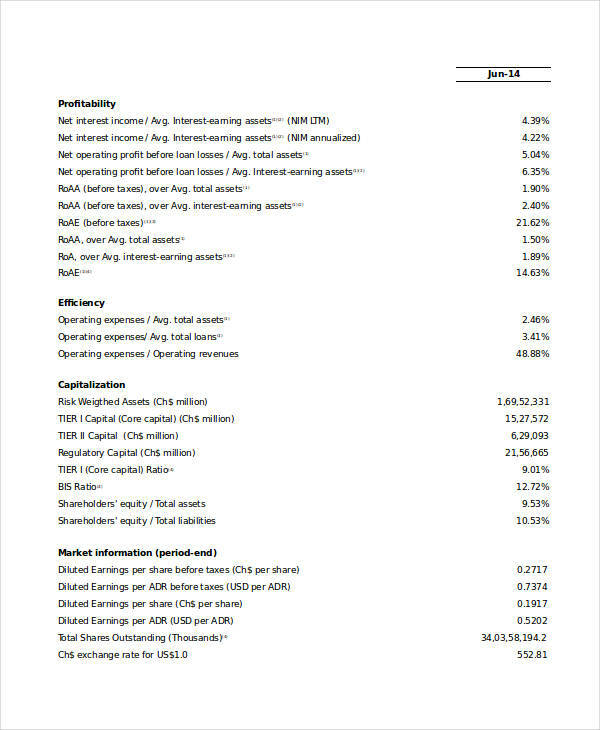 The projected profit and loss statement is a forecast of the statement for the coming financial year. 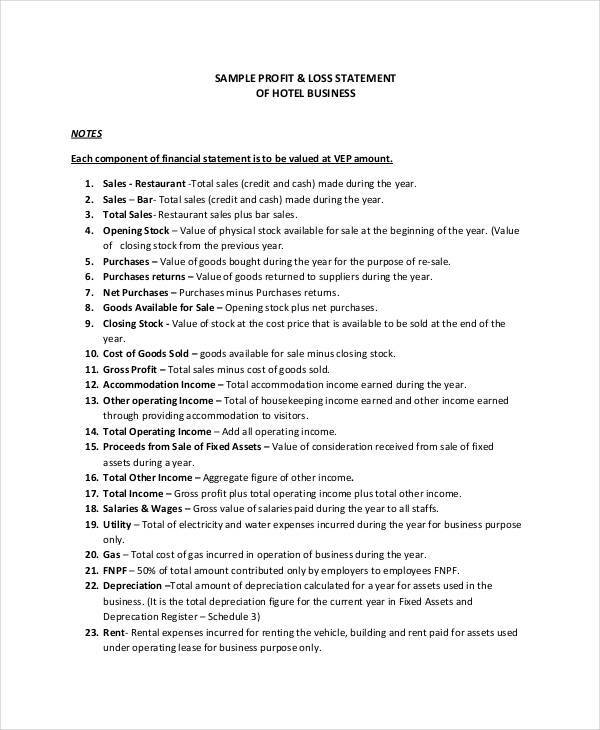 It would basically contain first the next month’s projected income statement along with predicted financial statements based on previous income statement data typically contained in a business plan or financial strategic plan. 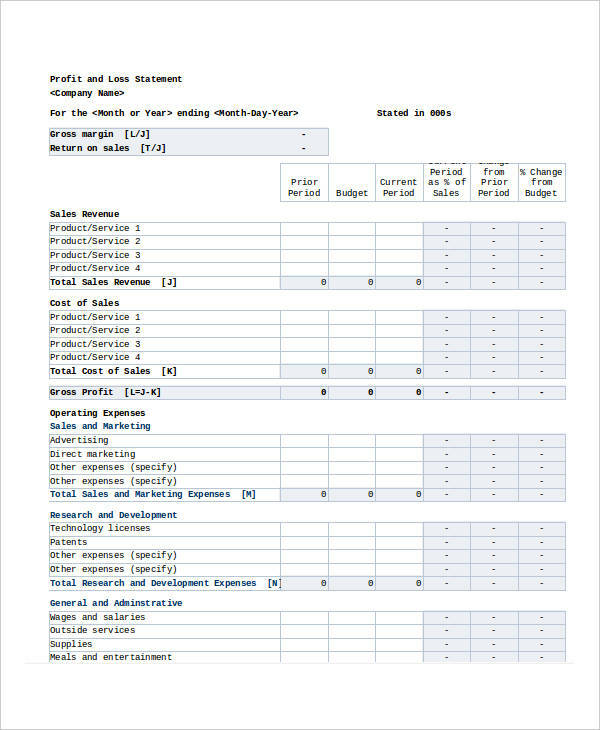 The income statement also acts as a medium in analyzing the internal health of a business by comparing available data in relation to each sale and expense versus the overall budget of that projected year. 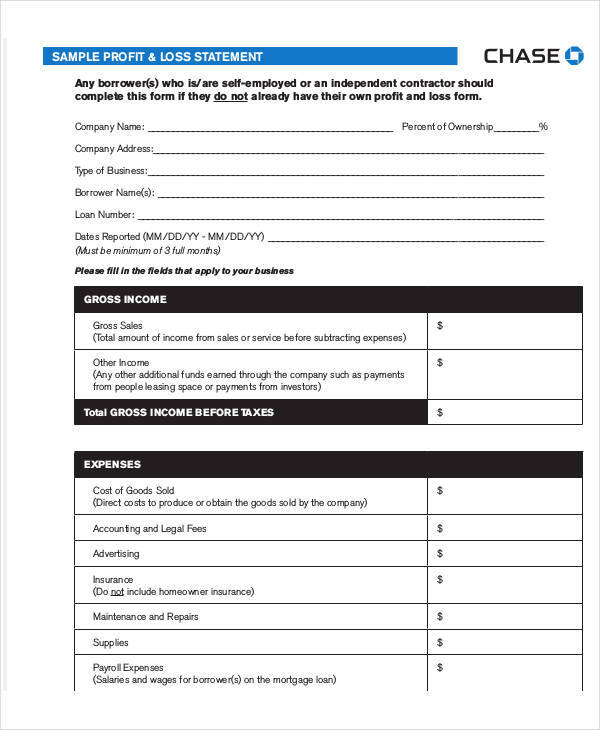 In filing for business tax returns, all income and expenses for the entire financial year must match and data from monthly income statements help in simplifying the work of the person making the filing of these taxes in the business. 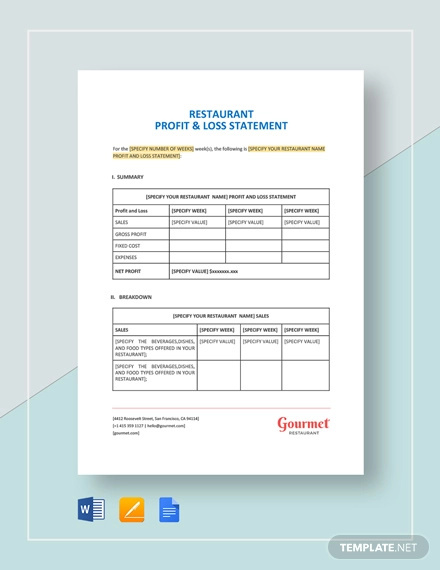 In summary, a profit and loss statement helps any business know if they are doing well or not, by measuring the main indicator of company health: its profits and its losses.